Home » child cpr » What do you do in the first five minutes in an emergency with an infant or child? What do you do in the first five minutes in an emergency with an infant or child? Posted by Geraldine Hickey RN on April 28, 2015 in child cpr, Child safety, Family safety, First aid for children, Infant and child safety, Infant CPR | Comments Off on What do you do in the first five minutes in an emergency with an infant or child? 1. Take a deep breath and make sure the surroundings are safe for you. It will serve no purpose to run into a dangerous situation. 2. Try to find out what happened to determine what kind of injuries the infant or child sustained. 3. If you think the child has neck or back injuries DO NOT MOVE him unless he is in an unsafe area or is face down and needs CPR. 4. Assess for immediate life-threatening problems. Use the C-A-B steps of CPR if the child is not breathing or responsive. 5. The scene is safe and you have determined the overall condition of the child, it is time to call for help. DO NOT HANG UP THE PHONE unless instructed to do so by the dispatcher. 6. Now you can turn your attention to helping the child. Look for any bleeding and apply direct pressure using a clean, thick absorbent pad or a clean towel or shirt. 7. Suspect shock if there is severe bleeding. If present lie the child on his back. Keep him warm using a blanket. 8. If you suspect a fracture or broken bone, leave the injured part in the position you find it. Do not attempt to reset the bone yourself. 9. 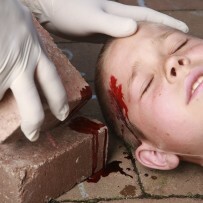 If there is a head injury and bleeding apply direct pressure. Wounds on the face and scalp bleed a lot. If you suspect a skull fracture DO NOT put direct pressure over it. Remember to review the steps of CPR and First Aid on a regular basis so they are fresh in your mind.